Málaga’s charming and compact historic center is easy to navigate around and contains plenty of cafes and restaurants to enjoy, as well as the ruins of the old Roman theater, which dates from the first century B.C. For a taste of the city’s history, consider dining at the iconic El Pimpi bodega bar. You can enjoy a set two-course lunch with drinks for around €12 ($16). 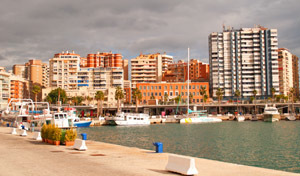 One of Málaga’s claims to fame is that it is the birthplace of Pablo Picasso. As such, the city boasts an impressive museum dedicated to his work. Open since 2003, there are 285 pieces on display, mostly donated by members of Picasso’s family. It costs €6 ($8) to view the permanent collection. Picasso’s actual birthplace lies a short distance from the museum on the Plaza de la Merced. Constructed between 1528 and 1782, the cathedral is an imposing presence in Málaga’s old town. While the €5 ($7) entrance fee may be a little steep, once you step inside, it’s more than worth it to marvel at the breathtaking Renaissance interior. Afterwards, stop for a coffee at the El Jardin cafe overlooking the beautiful cathedral gardens, which are filled with sculptures and orange trees. 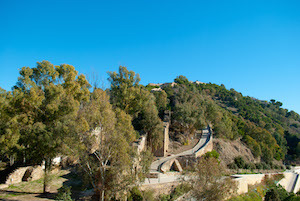 Adjacent to the historic center lie the Castle of Gibralfaro and the lower fortress, Alcazaba, which were built in the eleventh century. The two monuments are separate, so you can buy a ticket for either, or a combined ticket for both (around €4.50/$6.20). The beautiful and tranquil Alcazaba is easily accessible and offers plenty to explore, with wonderful views of the port and beyond. You can continue the climb up to the castle itself for majestic views of the surrounding area. A short stroll from the old town lies the port area, which has been developed into a stylish entertainment venue filled with restaurants and shops. Beyond that is the long sandy beach, Playa de la Malagueta, where you can take a gentle stroll, sunbathe, or take a seat at one of the beachfront restaurants to enjoy fresh sardines straight from the barbecue. There are also plenty of free restrooms — a rare thing in Europe! In terms of practicalities, travel from the airport to Málaga itself is a cinch. Simply take the A-Line Express from outside Terminal 3. It costs €3 ($4) for a one-way trip into the city (which takes about 25 minutes). For the historic center, stay on to the last stop on the line (Plaza del General Torrijos). Accommodation-wise, it’s worth remembering that in many European countries, a hotel’s star rating likely refers to the availability of facilities. For example, the ideally-located Hotel Carlos V (around €50/$70 a night) is rated only two stars, despite offering excellent standard rooms and service, simply because there’s no restaurant or bar on site. So the next time you’re considering a trip to Spain, look beyond the airport and spend a few days enjoying all Málaga has to offer.